The E3 Media and Business Summit, formerly known as the Electronic Entertainment Expo (E3), and commonly known as E3, is an annual trade show for the computer and video games industry presented by the Entertainment Software Association. It is only open to game industry professionals, journalists, and guests of exhibitors, such as celebrities. 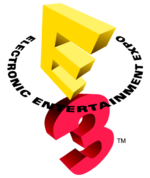 E3 was usually held in the third week of May of each year at the Los Angeles Convention Center (LACC) in Los Angeles. As of 2007, E3 is invitation-only, meaning that instead of around 60,000 attendees at E3 there were only around 3,000-5,000. The reason for this change is to allow for a more intimate atmosphere where business will be emphasised. A separate conference called Entertainment for All Expo has been created to accommodate the public demand for a major, annual video game event. Many games (and consoles) have been and will continue to be announced at E3, including Grand Theft Auto IV and Grand Theft Auto: Vice City Stories, which were both announced at E3 2006. In 2008, Grand Theft Auto: Chinatown Wars was announced at Nintendo's press conference.